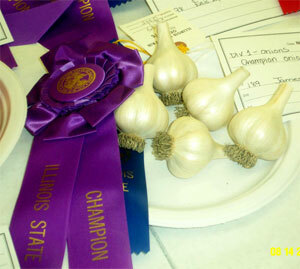 Mr. Weistart won first place at the Illinois State Fair in 2003 for his garlic. Here are suggestions for amateur garlic growers who want to harvest good bulbs, cure them properly, and prepare some for an award winning display. They are based on a decade of raising garlic, talking with other growers and studying references on the subject. With this information I was fortunate enough to win both individual first place and group championship ribbons at the 2003 Illinois State Fair, with the first garlic display I ever submitted for competitive judging. Now, my neighbor asked if I bought the bulbs at the local Shop and Save, but we can discount that as sour grapes, since his tomato plants are puny compared to mine and his onion crop is pitiful as well. 1. Go Organic. Forget about Miracle Grow, Sevin and other manufactured fertilizers and chemicals that do nothing for the structure of the soil or microorganisms that support and nourish your plants. As one alternative, look at products on the www.gardensalive.com Web site. Kelp and fish emulsion sprays, for example, are natural products that benefit the soil environment. The latter is cheap and available from Lowe's. I have also amended my soil with soybean meal and dehydrated alfalfa. Note that the soybean mix can really smell for a while in hot weather after it rains. Elizabeth Stell's Secrets to Great Soil is a valuable reference. 2. Use Compost. www.organicgardening.com has good information about composting, and The Rodale Book of Composting provides important basic information. www.soilfoodweb.com is another resource, with Dr. Ingham's The Compost Tea Brewing Manual an invaluable source for understanding plant nutritional needs. Making compost is a subject in itself. I make mine from fresh-cut grass (not chemically treated with Weed and Feed, etc. ), shredded dry maple leaves, and coffee grounds and filters from a local Barnes and Noble Starbucks Café. These ingredients are mixed in a proportion that produces a carbon to nitrogen ratio of between 25 to 1 and 35 to 1. 3. Develop Raised Beds. Sell the tiller, and get a broadfork(www.leevalley.com sells a good one). With judicious use of compost and raised beds, there will be little need for a tiller, which greatly disrupts soil structure. Make sure to not walk on the beds, as that compacts the soil. Instead, make walkways between the raised bed rows, and layer them first with whole newspapers and then top with cut grass or shredded leaves. The newspapers will stop weeds cold. Like most plants, garlic does best if the raised beds are in full sun, with no tree roots to rob the garden of nutrients. Take a look at Patricia Lanza's Lasagna Gardening, which expounds on sheet composting, but forget about her overuse of peat moss, which is acidic and not a renewable resource. 4. Plant Big Cloves. Small garlic cloves will produce small bulbs at the end of the growing season. Don't use store-bought garlic, as it is treated with growth inhibitors. www.TheGarlicStore.com and www.FilareeFarm.com are reliable sources for seed cloves. Their sales literature includes helpful descriptions of varietal types, and planting instructions as well. Filaree also publishes a reference that serious garlic growers need in their bookcases -- Ron Engeland's Growing Great Garlic. Engeland has a reasoned presentation on the subject of cutting flower stalks on hardneck garlic. Bottom line: if your soil is in the right condition, there is no need to cut the center stalk that grows up from the bulb. I have never cut them off until after the bulbs have cured. Engeland thinks leaving them on may help extend the storage period. 5. Grow Hardnecks. Hardneck varieties produce bulbs with fewer but bigger cloves. I've had excellent results in our northern climate with the Porcelain variety, including Georgian Crystal (my State Fair winner), Georgian Fire and Music. (I understand that gardeners in the South do better with softneck varieties) I've read that it takes several seasons for a garlic strain to become acclimated to a particular garden, so you'll want to save the biggest cloves from each harvest for planting the next fall. Plant around six weeks before the first hard freeze of the fall, and cover with four inches of mulched leaves, straw or grass. Don't use unshredded leaves, as they will act as a moisture block. This cover prevents the cloves from being pushed to the surface with cycles of freezing and thawing. Plant an inch or two deep, six inches apart in the row. I've had luck planting three rows close together (eight inches apart), so long as there is nothing crowding the raised bed on either side. Keep weeds to a minimum (the mulch will help with this). Apply regular foliar sprayings of kelp, fish emulsion and compost tea. Side dress the plants with organic fertilizer up until mid-May. Stop watering at the end of May, when the plants quit growing leaves and begin to form bulbs. 6. Harvest Early. Harvest when sixty percent of the leaves are still green. Each leaf corresponds to one wrap around the bulb. Any breach of the wrapping will allow bacteria to spoil the cloves. Do not leave the harvested plants in the sun even for a minute, as the sun's rays will literally cook the raw bulb. Try to harvest prior to a rainy period. I dig mine up the first week of July. Brush off excess dirt, but don't wash the bulbs. If humidity is a problem and soil is clumped on long roots, I trim them down to an inch or two, as roots wick moisture from the air that may contribute to mold at the bulb base. Cure in the shade, preferable in a relatively cool place with low humidity and good air movement. A friend hangs his garlic in a corn crib with good results. I hang mine from rafters in a garage with an overhead fan. In times of high humidity, I put a dehumidifier in the garage when I can't leave it open. Let the garlic plants hang for a month, or until the center stalks turn brown. After curing, store garlic at room temperature. 7. Select Prime Bulbs. Competition bulbs (a set of five or six is generally required) should be well formed and free of blemishes and black spots on inner wrappings, which indicate a fungal presence. Judges are looking for a uniform set, and not necessarily for oversized bulbs. A picture of my winning display may help here. Cut the tops one inch from the bulb, and trim the roots straight across at a three-eights to one-half inch length. If the inner core of any cut top is not pure white, substitute another bulb. I believe Porcelains make a great presentation, due to their satin wrap and fine light brown lines.